MANUSCRIPT ACCEPTED: The article entitled "Functional considerations in ALPPS – consequences for clinical management" has been accepted for publication. Associating liver partition and portal vein ligation for staged hepatectomy (ALPPS) represents one method for preconditioning the liver prior to liver surgery. The ALPPS procedure is a two-stage hepatectomy has been reported with initial surgical exploration. During the first step, in situ splitting of the liver along the falciform ligament in association with portal vein ligation is performed to induce hypertrophy of the non-ligated future liver remnant. The second step - several weeks later - is the resection of the before primarely non-resectable tumor or metastasis. In our work by Stockmann M et al., we provide insights into the alterations of liver function after ALPPS step I and step II. The liver function capacity is significantly impaired after ALPPS step I but recovers within 1 week after ALPPS step I and the volume function analysis prior to step II showed very good correlation with the postoperative assessed liver function. In conclusion, these data show the volume function analysis is reliable in ALPPS. MANUSCRIPT ACCEPTED: The article entitled "Kinetic validation of the LiMAx test during 10,000 intravenous 13C-methacetin breath tests" will be published in the Journal of Breath Research. 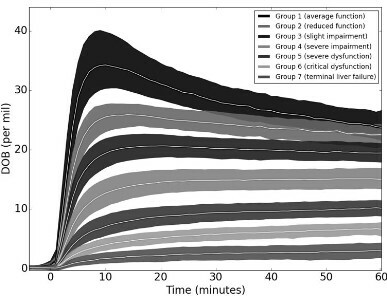 The work includes the analysis of 10.000 intravenous 13C-methacetin breath tests and reveales specific delta-over-baseline (DOB) patterns and influencing factors on DOB kinetcs that will be helpful to improve the sensitivity and specificity of the test and by using a novel analytical algorithm shortening its duration. The figure (right) shows the kinetics of over 10.000 LiMAx tests assigned to categories based on the functional liver characteristics. With a short notice of only two days prior to the run, we were happy to be one of the 170 Charité teams participating in the race. 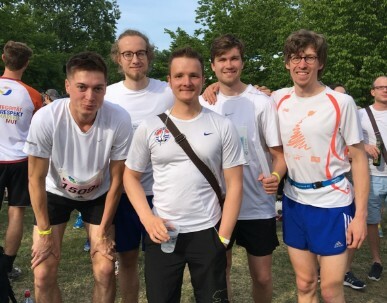 By the excellent physical fitness of our team members (Jonas Wizenty, Marcus Glöckler, Tilo Wuensch, Ludwig Wiegank and Niklas Heuke), we finished the 5x5km run in a total time of 1h 50min and 38sec. With this excellent time, we managed to place 40 out of the 1980 participating teams and are ranked among the top ten teams of Charité. 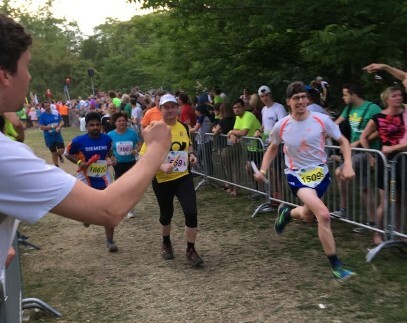 The 5x5km-TEAM-Staffel is an annual running competition and Germany’s biggest relay race. The course starts and ends within the government district of Berlin, next the the Kanzleramt, and leads through the Tiergarten. Doctoral student Elisabeth Blüthner has been awarded Best Poster Presentation at this year’s Chirurgenkongress in Munich, the leading German conference on visceral surgery. The presented study was entiteled "Significant impact of liver function on recurrence-free survival after curative liver resection for HCC", conducted under supervision of Prof. Stockmann. In brief, although curative resection for hepatocellular carcinoma (HCC) has been proven to be the most effective therapy, high HCC recurrence rates strongly affect 5-year survival of resected patients. Identifying early clinical markers that reflect postoperative HCC recurrence risk could be useful for personalized screening strategies following curative HCC resection. In a case series of 146 patients, the dynamic liver function test (LiMAx) was tested amongst other liver function and disease characteristics to predict recurrence-free survival. The results suggest that - beside the severity of the underlying liver disease – the preoperative assessed LiMAx value is a reliable predictive marker of recurrence-free survival. In conclusion, patients presenting with impaired liver function determined by the LiMAx test should be evaluated for intensified treatment and closer oncological follow-up.